Senega snakeroot is a perennial plant, 6-18 inches tall; the hard, crooked, snake-like rootstock produces 15 to 20 or more smooth, erect stems which grow from 6-18 inches high. The alternate, lanceolate leaves are sessile or almost so and come to a fairly sharp point. Small, pea-like, white or greenish flowers grow in dense terminal spikes, 5 sepals, 3 petals and the capsules are small, 2 celled and 2 valved; from May to June. 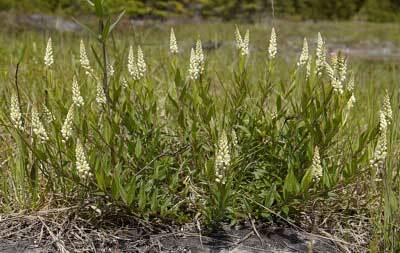 Native to the rocky woods and hills of eastern North America, growing as far sough as North Carolina and Arkansas. Most commonly used as an expectorant in respiratory problems. The Seneca Indians, who introduced it to the white man, chewed the root to make a mash which was applied to snakebites after cutting the bite and sucking out the poison. Native Americans also used the root tea as an emetic, to induce sweat, to regulate menses, for colds, croup, pleurisy, iritis, blood poisoning, smallpox, rheumatism, heart troubles, convulsions, coughs, and poulticed root for swellings. Historically, root tea was used similarly but added pneumonia, chronic bronchitis, whooping cough, asthma; thought to relax the respiratory mucous membranes. Research suggests use for pulmonary conditions. The rootstock is used dried. Gather in autumn just before the frost. Infusion: steep 1 tsp. root in 1 cup hot water. Take 1 cup a day, a mouthful at a time. Tincture: a dose is from 5 to 10 drops. Large doses cause vomiting and diarrhea; an overdose is poisonous. Use with medical supervision.